Carnegie: Magic Detective: Episode 2 of The Magic Detective Podcast is UP! Episode 2 of The Magic Detective Podcast is UP! I'm really having a fun time with these podcasts. I just uploaded episode 2, and episode 3 is finished and will go this weekend. Episode 4 however is one that I'm REALLY excited about. This one has the first feature that was written specifically for the podcast and will also be a blog article. That is what I had hoped to do all along, use both mediums to complement each other. In Episode 2, I share some Washington D.C. connections to Magic History. The 15 item list can be seen here. 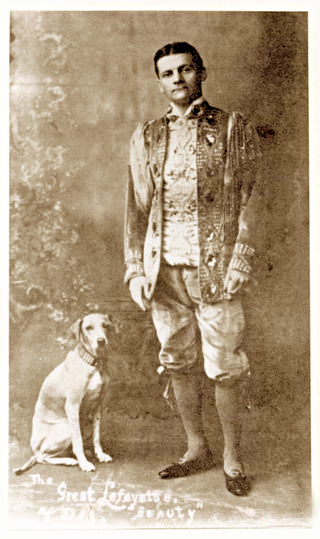 During the HOUDINI RADIO Segment, I share the story of where Houdini got the dog that he gave to The Great Lafayette. Of course, that dog, whom he called Beauty, would be Lafayette's companion for the rest of his life. If you'd like to read more about Lafayette & his dog Beauty, follow this link. I'll be experimenting with the Interview feature next week, so hopefully by the time I get to episode 5 or 6, I'll be ready to conduct some awesome interviews. And WOW, do I ever have a list of people!!!! You probably know some of them, and you might even BE one of them, lol. And I expect to have quite a few people that maybe you've not heard of but have so much to share! Personally, I have gathered a great deal of information that I have never used for the blog. Now, I'll finally get a chance to use it for the podcast. I have a couple of interviews I did with people who have since passed on, so those might be fun to include. In addition, I've got some wild ideas that I just can't reveal, yet. There is one thing I'm very careful NOT to do, and that is reveal secrets. I'm very old school in that regard, so I won't be tipping any big secrets. I know there will be non-magicians listening to the podcast and I don't want to give away the farm, so to speak. I've done a pretty decent job of keeping secrets out of the blog all these years, with the exception of two incidents which are among the 700+ blog articles, so I guess they're safe.